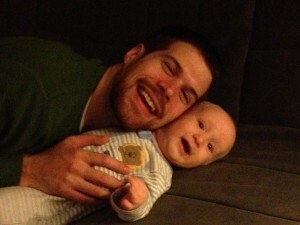 My husband, Corey, and our youngest son, Felix. I sometimes forget to appreciate how supportive he is, how he wordlessly takes over cooking dinner if our baby needs to eat or doesn’t even comment when I say I can’t deal with our preschooler’s poopy diaper because, well, the baby might be hungry. I also sometimes forget to verbalize how I need him to support me, so I’ll spend a few hours angry that he’s not acknowledging my extra caloric needs before I remember to tell him I need some verbal encouragement. So far today, my nursing partner carefully extracted my nursing bras from the laundry before moving the load to the dryer. He scrubbed out my pump parts with a tiny brush to make sure no mold would grow in the flanges. He occupied our older son while I took an extra long time nursing our baby to sleep for his first nap. When I got dressed and planned for a few errands, apart from my baby, my loving nursing partner even reminded me that I might want to shove some nursing pads into my bra. Just in case. I want to make an effort this week to acknowledge how much his support means to me. Because, darn it, he’s awesome! What has your partner done this week to support your nursing relationship with your child? Leave a comment to let us know! I do not nurse because I am male, but I wanted to acknowledge the great story of support. This does not come around too often. That is why it is such an inspiring story about love. Your husband loves you and his child. He knows the child does not understand, but he or she will appreciate.